My late grandfather, Kenneth Kenji Ota, a World War II veteran and native of Seattle, was a student at the University of Washington just before the attack on Pearl Harbor in 1941. While there are many things we'd like to remember about our loved ones, there is one essential reason my grandfather should be remembered. Japanese Americans and issei (first-generation people of Japanese descent) in the Pacific Northwest were forced into American concentration camps under Executive Order 9066, passed on Feb. 19, 1942. Some 120,000 people, two-thirds of them American citizens, had to leave their homes. Families were split, livelihoods left behind and many UW students had to quit school. My grandfather was one of those students. In an interview with the Go For Broke Educational Foundation (dedicated to preserving the memory of Japanese-American veterans), my grandfather said he knew they would be put in camps, so he did not finish his senior year. While the UW did recognize many Japanese Americans who were not able to finish college before they were sent to camps, only those registered at the university in September 1941 were bestowed honorary degrees in 2008. After graduation from Garfield High in 1937, my grandfather worked in salmon canneries in Alaska, helped with the family business and went to the UW for three years. Given all that he was doing, he may not have been registered at the UW in 1941. After Pearl Harbor and the removal to Minidoka, he had no choice. That's why I feel my grandfather should also have his recognition. It was never the nature of my grandfather to ask for acknowledgment of his accomplishments. He was a very humble and vibrant man, a father, grandfather and friend. Since he is not here to speak, I'd like to share how he contributed to our society. Before retiring, Kenji worked for many years as a buyer for Boeing. This job was very important to him because it had been difficult for him to find employment after he was released from a 15-month stay in Army hospitals for reconstruction of his arm, shattered by machine-gun fire in the war. 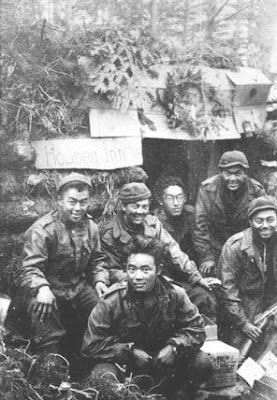 He was a 100 percent disabled veteran of the all-nisei (second-generation Japanese American) 442nd Regimental Combat Team, the most decorated unit for its size and length of service in the history of the U.S. military. My grandfather was a platoon sergeant in the 442nd and was wounded the day before the 442nd rescued the Lost Battalion (from the 36th Texas Division), which had been surrounded by Germans in Northern France in 1944. For his military service my grandfather received two Purple Hearts and two Bronze Stars. He never boasted about these medals or spoke of his service much, but he did sacrifice a lot. Perhaps because he was only able to finish three years at the UW, education was important to my grandfather. He proudly supported both of my uncles and my mom's cousin so they could graduate from the University of Washington. When I graduated from UW in 1997, my grandfather was proud and told me not to stop there but to continue my education. Today I'm pursuing my Ph.D. in American studies at the University of Hawaii at Manoa. I know that we'd all like to honor and remember our loved ones and appreciate the lessons they passed on to us and more importantly the sacrifices they made for all of us. What I'd like to remember about my grandfather is that while he gave up his senior year at UW, he did give our family a lot. With this coming class of 2012 at the UW, please give a little thanks for all our ancestors and grandparents who have given so much to our education and lives. Angie Lead lives in Oahu.